Aleix Gelabert and Didac Costa crossed the finish line off Barcelona's W-Hotel at 21.12 UTC on Wednesday, April 8th. The Barcelona based duo returned to their home port in fourth place - both sailors completing their first circumnavigation, non-stop, having covered the 23,321-mile theoretical course in 98 days, 9 hours, 12 minutes and 9 seconds. We Are Water are expected to follow them home in fifth tomorrow afternoon. 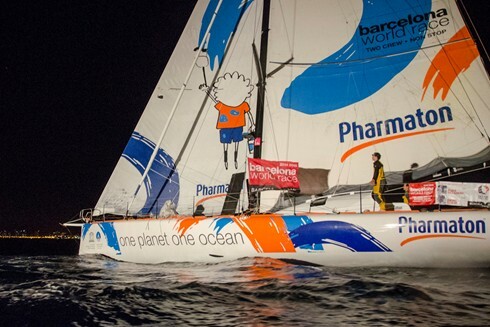 In the end, the Mediterranean was kind to Aleix Gelabert and Didac Costa on One Planet One Ocean & Pharmaton. The Barcelona duo, who had fought so hard and so exceeded expectations to score a hugely deserved fourth place, were granted a respite from the battering headwinds which signalled their entry to the Alboran Sea, whilst avoiding the shoreside shutdown of breeze which plagued earlier finishers. One Planet One Ocean & Pharmaton instead enjoyed light south-south-easterlies over the course of this afternoon, which carried them downwind to the finish line in front of the W Hotel at 5-6 knots. The duo sailed an actual distance of 27,791 miles in 98 days, 9 hours, 12 minutes and 9 seconds, at an average speed over the ground of 11.8 knots. They arrived 14 days, 3 hours, 21 minutes and 44 seconds after the winning boat, Cheminées Poujoulat, skippered by Bernard Stamm (SUI) and Jean Le Cam (FRA). The Catalan pairing onboard One Planet One Ocean & Pharmaton were the undisputed ‘rookies’ of the race – this was their first attempt at a round the world voyage, neither had ever sailed in the Southern Oceans, and yet they not only finished fourth, but were the third team to complete the course non-stop. Gelabert and Costa’s fourth place is all the more impressive given that they were racing the oldest IMOCA 60 in the race, the 2000 design which was famously sailed by Ellen MacArthur to second in the 2000-01 Vendee Globe. Having gone through many thorough refits and three round the world trips – including two Barcelona World Races – the Owen-Clarke design is a one of the most enduring of the IMOCA fleet and much loved by those lucky enough to sail on her.